Every day of spring was a day of changing development and disorder met with directed management efforts. The life of the forest’s top predator was filled with one crisis after another, interspersed with properly restful naps under the soothing whir of gently waving pine needles. Following the shocking confrontation with the invading dog Deuce, Harvey had returned to the deepest part of the forest. His avoidance of Good Christ, the great red fox, was purposeful as well as it was expectant. Good Christ, secure in recovering from the wounds inflicted by the terrible marauding of Holy Moly, remained down in her own territory. The fox’s return would be met with direction and dominance. That the fox was bigger, stronger, quicker and more resilient than any other living creature in the entire forest area, including Harvey, now meant that the forest was more protected instead of less. To be allowed to live in the forest through disabling pain and injury did not allow for Good Christ to return to a position of supreme dominant predator. Harvey’s eyes blinked open at half slit. The glint of intellect and long life experience surged out of them but fell upon no audience. From under the spreading pine Harvey was invisible, even to the crows, although Right Claw, Left Eye and Nothing Crow knew exactly where he’d chosen to take his midday nap, and they made it obvious to one and all that they knew simply because they chose the same tree in which to take their mid-day rest. The difference being that there was no napping done wherever the three settled. A piercing irritable dialogue about only things crows could possibly understand went on ceaselessly. Harvey was left to presume below that most of the obnoxious discussion was about him; where he was and what he might do next. He closed his eyes once more. The crows were part of the forest and there was nothing to be done about them unless one or more of them ever became injudicious enough to land on a branch too close, or dip into the clear running stream waters without remaining on guard. Harvey’s eyes snapped open, but he didn’t move from under the tree. His front paws pressed down through the dried pine needles to establish a grip on the firm ground just below. A shadow had flitted across his still form while he slept and the crows had either left Harvey’s part of the forest altogether, or gone totally and uncommonly silent. Harvey waited. To extend himself out beyond edge of the giant pine’s lower limbs would be to lose his cover and concealment. It was wiser and safer to stay where he was and wait, all sense alert, for whatever the extremely brief shadow might portend. There was only one kind of animal whose presence would cause the forest to go silent with dread. The one kind of predator that was ignored, for the most part, simply because it seldom made its presence known, and when it did it never stayed around for any length of time except during the early days of spring when it nested and hatched its young up near the northern-most extremity of the forest. Good Christ’s territory; or territory that really didn’t matter much to Harvey or the animals that never went there. Harvey knew it was the giant hawk because his alpha male human blurted it out from the road nearby. “There it is,” the human said, pointing upward with one hand, while cradling something with the other. Harvey peered out. He knew he would not be able to see ‘There It Is’ from his protective place under the pine but he could make out his human on the road. Astoundingly, the human was holding another cat. Harvey’s eyes focused to pin points. The cat struggled to be released and bore a close resemblance to Bad Taffy, but was not Bad Taffy. Harvey lay stunned. Could there be any more ways his human could come up with to embarrass him? What kind of cat name was that? There was no point in coming out from under the pine, even if his human might know he was nearby. Waiting was almost always better than finding out something too soon. Harvey began to let his eye slit shut once more. The indoor cat named Gwennie was suddenly right there in front of him while his alpha male tried to part the thick brush to find her. Harvey stood and stepped from under the pine needles. Gwennie instantly fled toward open ground further up the stream. Harvey automatically followed, leaving the human to futilely search behind. And there stood the hawk waiting. The giant hawk spent most of its time flying or sitting in one of two places. Either at the very top of Harvey’s house or high in a big oak way deep down in Good Christ’s territory. The hawk only came down to swoop over potential game, and there was no other animal in the forest not qualified to be that for the huge bird. Even Good Christ would be foolish to attempt to take on the bird. Sharp claws and teeth were little match for giant talons and a needle-pointed beak that could slice through a sapling like it was a swamp frond. Gwennie began to curiously approach the standing bird. Harvey took in the scene instantly. The hawk knew that his prey was unschooled and experiencing his kind for the first time. All he had to do was wait until it was on open ground and close. The hawk would rise up and then plunge down to sink its talons into Gwennie’s back and then lift up back into the air. And that would be that, except for the violation of Harvey’s territory, and what would follow from the unpredictable anger of the human who’d let the cat go. There was only one thing to be done. Harvey leaped into the air and pounced upon Gwennie’s exposed back. Even with his claws fully retracted, and closing his jaws gently instead of biting deep Gwennie was flattened into the damp but solid stream bank. The shock stunned the indoor cat completely and she lay as if dead under his paws. Harvey immediately rose up to face the hawk, letting out the most powerful hiss he could summon. His message was clear. The kill was Harvey’s own and the only share the hawk might have would be when Harvey was done taking his primal portion. “There It Is” stared at him with its head turned. One eye shown, unblinking, but glinting with reflections from the nearby passing water. There It Is fluttered its wings to make itself appear larger, but it did not flee. Harvey hissed again, not relinquishing his full press upon Gwennie’s back. However, the hawk was not backing down, and in a full on fight, cat to hawk, there would be no unscathed winner. But it was There It Is’s call to make. Harvey could not move backward or Gwennie would rise up to be slain, although the nearby trees and bushes offered plenty of cover, especially from the potential effects of an attacking bird. Harvey had fought smaller predatory birds when he was younger, and knew that the hard tough animals gave away all advantage once their wings could not be used for balance and mobility. A hawk could not fight a battle inside a bush and have any chance of winning. “You’re around here somewhere,” Harvey’s human said, clomping through the brush and coming up behind him along the bank of the stream. The hawk leaped into the air but then landed again, this time closer to where Gwennie lay with Harvey pinning her down. The human’s presence irritated the predator but did not dissuade it from attacking. Harvey’s alpha male checked out some device he held in his hand as he approached, oblivious to the scene displayed before him. Only when he arrived just a few cat lengths away did he see what he was facing. His hand came down and he made a typically human sound. “Oh,” he blurted out, stopping for no explainable reason. The three crows began screaming from some vantage point high above, as if cheering on the participants of whatever might be going on below. “Gwennie,” the human said, stupidly. The cat responded by jerking out from under Harvey’s paws and then vaulting into the human’s arms. That move set There It Is in motion. The prey was his and Harvey was to be ignored. The hawk flapped loudly into the air and flew directly at the human. Harvey’s alpha male scrunched down, hunching the cat to his midsection and quickly turned exposing his naked back to the hawk’s talons. Harvey leapt up at the striking hawk, his considerable ability to vertically vault on full display. The hawk was moving so fast, so quickly, that Harvey was only able to strike its body with his shoulder as he went by. It was enough to save the human’s idiotically exposed back. Then it thudded into the human. The strike sounded like a large stone landing in mud. There It Is screamed louder than any bird Harvey had ever heard. It recoiled from the humans back and righted itself in midair. Its great wings fully extended, it thundered upwards, missing all the branches of the overhanging trees. And then it was gone, as if it had never been there. Only a few feathers floated down from where it had been. Harvey’s human wasn’t so lucky. 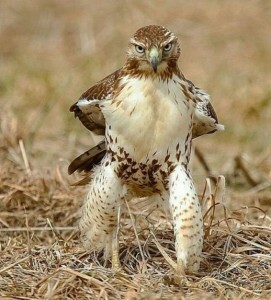 The hawk had upset his equilibrium, which wasn’t very good at the best of times. His hands went out for stability. 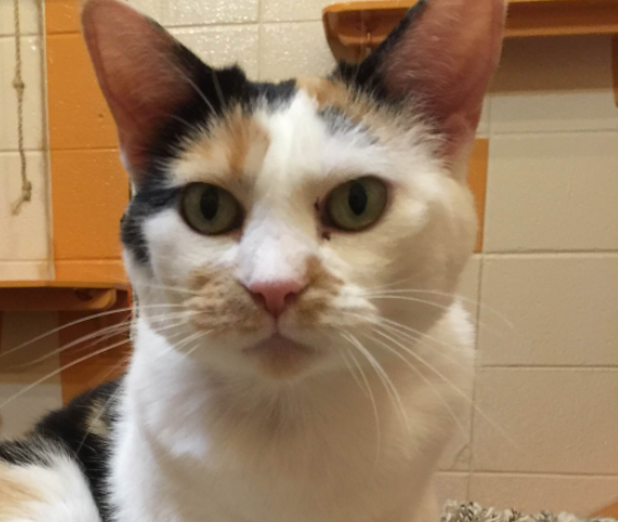 Gwennie flew from the release of one arm while the human’s device sailed through the air in another. Head first, the human plunged into the stream, as if executing a purposeful dive. Gwennie stopped to sit and watch the man struggle, as if she’d had nothing to do with anything. Very slowly the man turned over and sat up. “Not again,” he whispered. “I’m never coming out here again. Ever.” The human kept repeating ‘ever’ over and over as he hunted for his device, but it was nowhere to be found. He gave up, turning to face the patiently sitting Gwennie. Harvey had landed in the middle of a bunch of prickly plants. He carefully removed himself and then broke free to return to the clearing. “I don’t care if you stay out here or not,” Harvey’s alpha male said, his voice low and threatening. “You’re supposed to be an indoor cat, so act like an indoor cat. If you want to play with hawks, then just follow Harvey. He does it all the time. Good luck.” He wiped himself down as best he could, and then turned to walk back in the direction of the house, making no effort to avoid the stream, its muddy bank or the heavy undergrowth between the forest and the house’s formal lawn. Gwennie turned her head to look at Harvey. Harvey stared back at her, sitting not more than five cat lengths from her. She was on her own. Tentatively at first, Gwennie got up and walked over to the stream. Making it appear as the most natural thing in the world she leaped across and then scampered to catch up to the fast disappearing human. Right Eye, Left Claw and Nothing crow plopped to a landing not one length from where Harvey sat contemplating. For some reason they felt no fear whatsoever. Harvey scowled and pounced, but only a few paws forward. 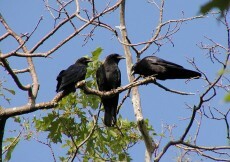 The three crows screamed together and leaped up onto the branch of an overhanging oak. It was Harvey’s forest and Harvey was going to have to do a better job of letting all of his minions know; interlopers and predators alike, that they lived in the that forest only at his sufferance.